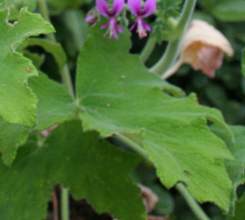 This summer flowering pelargonium has bristly leaves, hence its name. 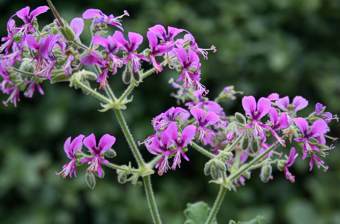 Pelargonium hispidum is an erect, branched, evergreen shrub, 2.5 m high, with a diameter of 1 m. The stems of the plant are herbaceous when young but woody at the base. The aromatic leaves are green to dull green with conspicuous veins and glandular hairs present. The leaf blades are irregularly incised. The plant is characterized by an extensive inflorescence with a profusion of small dark to light pink flowers. It flowers throughout the summer from September to April but has a peak flowering period in October and November. 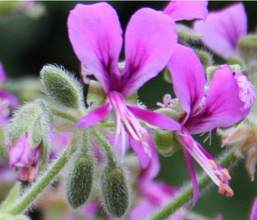 Pelargonium hispidum is common in its habitat and has a conservation status of Least Concern. The hispid pelargonium occurs in the mountains of the Western Cape, the Swartberg Range, Piketberg eastwards for about 450 km to Meiringspoort in the Oudtshoorn area. The species is closely associated with mountainous habitats. It occurs on lower slopes in shady ravines, near streams, in between boulders or scree, at altitudes of 300 to 1000 m, but with one record of it occurring at 1350 m from the Swartberg Pass. It is associated with fynbos habitat and riverine forests. The soil in these habitats is usually sandy with high organic content. The temperatures in these parts are often high and some frost may occur during winter; the sheltered areas occupied by this species are less exposed to environmental temperature extremes. Pelargonium hispidum belongs in the Geraniaceae family, a large cosmopolitan family of ± 11 genera and 800 species in subtropical and temperate regions of the world. There are approximately 270 species of Pelargonium which occur in S, E and NE Africa, Asia, St Helena, Tristan da Cunha, Madagascar, Australia and New Zealand, of which 219 occur in southern Africa. 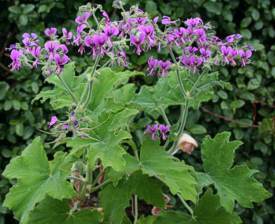 The genus Pelargonium gets is name from the resemblance of the shape of the fruit to the beak of a stork, pelargos in Greek, while the Latin species name, hispidum, refers to the coarse, rigid, erect hairs or bristles which are harsh to the touch on leaves and stems. The Afrikaans adjective, grofharige, also refers to the coarse rigid hairs. The seed is adapted to wind dispersal; it is light in weight and has a feathered, spiral, tail-like attachment. When the seed lands and there is sufficient water in the soil, the tail becomes like a drill, twisting the seed into the soil so that the seed can anchor itself in the ground and prevent itself from being blown away, or carried away on moving animals. Pelargonum hispidum has no uses other than as an ornamental shrub in gardens. Pelargonium hispidum can be propagated from both seeds and cuttings. Cuttings can be taken at any time of the year from a healthy vigorous plant, from softwood or herbaceous growth. The use of a rooting hormone powder will speed up the rooting process, especially for the softwood cuttings. Place the cuttings in river sand in cold frames and keep them moist. The cuttings should root in 2-4 weeks. Give the rooted cuttings a 2-4 week weaning or hardening-off period and transplant them into a well-drained potting soil mix and place them in a sunny position. Feed with an organic based liquid fertilizer. As soon as they have formed a strong root-ball they can be planted out into the garden. Sow seeds in late summer to early autumn. The seed should be sown in a light, well-drained potting mix. Sow the seeds evenly in the seed tray and cover them with fine white sand or fine-milled pine bark. Water the seeds gently but thoroughly with a fine rose spray and place them in light shade with no direct sun. The seeds will germinate in 2-3 weeks. Pelargonium hispidum is a tough shrub suitable for coastal gardens, fynbos gardens, low maintenance and water-wise gardens. The shrub is able to grow in most soil types from full sun to semi-shade. In the Western Cape the best time to plant is during the rainy months of winter to allow plants to establish themselves before the warm, dry summers. Plants can be maintained in the garden for several years, but need to be cut back after flowering to keep them tidy and vigorous. Once established, they require water to encourage rapid and healthy growth. 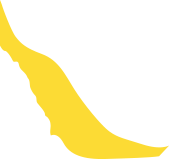 VAN DER WALT, J.J.A. et al. 1981. Pelargoniums of southern Africa, vol. 2. Juta, Cape Town.